Eric Pauly has a very challenging job as CentiMark’s Regional Sales Manager for the Northwest & Mid-Pacific Regions. He also has a very interesting hobby - bow hunting. And, he has an even more ambitious personal goal: to take wounded warriors on hunting trips. After 14 years at CentiMark, Eric manages 15 sales representatives and tech reps, assists with large deals, provides training, support and resources for his team and is responsible for a large territory. Eric also served four years in the Infantry of the United States Army in Germany, Bosnia and Macedonia. Last year, he hosted an episode of a hunting show called Outlander Limited Draw. It is a "DIY" type hunting show where he was featured on an archery black bear hunt in Idaho. Eric brings the phrase “Cast and Blast” to a whole new level as he packs his pontoon and bow down a 1,500 foot descent to the Henry’s Fork River in pursuit of black bear. The Outlander Limited Draw show is having a contest on their website to vote for a favorite episode. 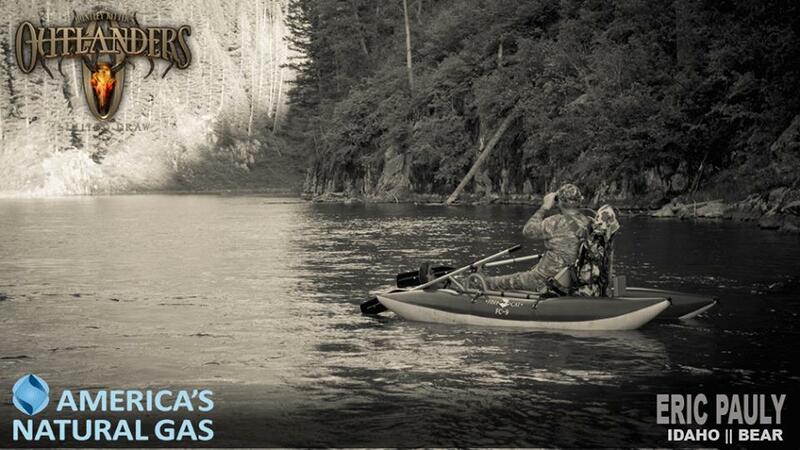 The winner will receive $10,000 in hunts and gear. Eric is trying to win the contest to select a disabled veteran who shares his drive for hunting and donate the winning package to him/her. Eric’s personal goal is to duplicate the process so that others can do the same for wounded veterans. CentiMark: How did you get started hunting? Eric Pauly: All of my family hunted when I was young. My dad died when I was very young and we moved away from the extended family, so I was left to pursue on my own. Big game hunting didn’t start until after my tour in the Army. After becoming proficient with all types of military firearms, it seemed only fitting that I pursue big game with bow and arrow. CentiMark: What is it that you like about hunting? Eric Pauly: I like the solitude - being in the woods. It’s quiet and peaceful. I like interacting with nature the way our ancestors did and knowing that I can survive as they did as well. CentiMark: What are some of your experiences with hunting? Eric Pauly: As a teen, I started hunting small game and birds. Over the years, I have taken deer, elk, antelope, grizzly bear, black bear, and kudu, warthog, zebra and gemsbok in Africa. CentiMark: What animals do you still want to hunt? Eric Pauly: All of them! I love seeing new places and matching wits with different animals. I will most likely be trying for archery moose next year in Alaska - but the dream is to take all of the North American sheep species - Dall’s, Stone, Desert Bighorn and Rocky Mountain Bighorn. Eric Pauly: It was an incredible experience. It is a DIY hunt so you cannot have help from any guides or outside sources. It was just two camera guys following me around for four days, while I got to show the world what I really love doing. Between the float trips and distress calls, we saw three grown bears and two cubs in four days. I had one come in to 15 feet behind me and stand on its hind legs (which they did capture on video), but the cameraman was between me and the bear so I couldn’t safely shoot. We were hunting around my property about eight (8) miles from Yellowstone filming every day from before first light (4:30 a.m.) until after dark (10:30 p.m.) We would camp at night and go to the clear cut areas in the mornings and evenings to call for bears and float the river in the evenings. I was finally able to call in a decent 5-1/2’ bear (after the camera crew left) to 30 yards and take him with a single arrow. CentiMark: Was that your first bear? What do you do with it? Eric Pauly: It was my third bear. I do my own butchering and meat processing so my family and I eat all of it (tastes like pork!) I also have the hides tanned or made into rugs. This particular bear I used to make a bear claw necklace for my eight year-old boy, Hunter. Eric Pauly: I am looking for someone that had a passion for hunting before his/her injury. One of the hardest things for returning veterans to overcome is the loss of the life they had before and the consequent battle with depression. Returning their focus to something they love (whether it be hunting, fishing, golf, skiing, etc. ), provides much more than a one time experience. It allows them to find solace and peace in their civilian life. I am an infantry veteran as well, but was lucky enough to return unharmed. Many of my brothers and sisters were not so lucky and I see this as a great opportunity to give back to them.